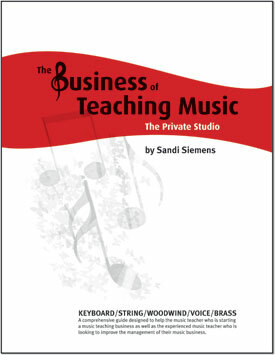 The Business of Teaching Music: The Private Studio is a must-have book for new and experienced teachers alike. Sandi Siemens offers clear and effective ideas for operating a professional music studio based on a lifetime of experience. Her book is a ‘detailed guide into her successful career as a business woman and teacher of voice’. Topics include: Finding Students; Initial Calls of Inquiry; Setting the Stage; The Music Studio Agreement; Keeping Records; Studio Communication Recitals/ Masterclasses/ Concerts; Obtaining Donations. The Appendix provides reproducible charts, agreements, record pages and notices – a real time-saver for busy studio teachers.